Now that Christmas is really near – again!, this means we’re another year older now – I’ve been really surprised by the nice folks at Textpattern forums. They’ve decided that this is a good moment to confer some utility to my whishlist and all the Textpattern developers and forum moderators. These guys are collecting money to buy us a Xmas gift, and I feel I have to say a big Thanks to all of them. I’m really amazed, are these the collateral damages of Open Source Development? ;-). It’s enough with the nice gesture guys, you can consider me gifted. 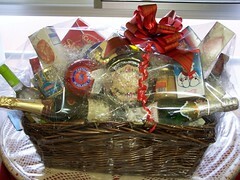 By the way, the picture is a photo of our Christmas Basket at KIU. Thank boss!. Merry Xmas to everybody and happy 2006!. I havent my own weblog yet to post something similar, but I just want to make Kusor words and feelings as mine too. Of course, amigo Kusor, that I also want to thank you and all the developers team for the wonderful script you work on. I love Textpattern and I love the TXP community. Kusor, I hope to see you posting often at TXP forums! You are missing all the fun! I’d really like to have the time to spend reading/answering forum questions, you can bet!, but it seems that you’re doing so good work that I’m more useful coding now, amigo Maniquí ;-). Thanks for the time you take to collaborate with Textpattern and to support users with the generosity you and all the forum moderators do. I’m more and more owe every day to be part of this nice community of people. Hey man, it’s worth it! Your tag manual is what helped me get my start. Through doing Textpattern driven sites, I was able to build my portfolio enough to land a great job. Keep up all the great work. You, Dean, Zem, Rob, and all the rest of the TXP crew are awesome.